James Wetherill Shaffner, son of Albert Sidney Johnson and grandson of Richard Wetherill, early day explorer of southwestern Anasazi ruins, was born in Tucumcari, New Mexico February 7th, 1947. After attending public school in Tucumcari, New Mexico and graduating in 1965, he attended Eastern New Mexic o University (ENMU) in Portales, New Mexico for two semesters before being drafted into the US Army at Fort Bliss, Texas and Fort Eustis, Virginia. While in the army he served a one year tour of duty in Viet Nam and was stationed at such places as, An Khe, Chu Lai, Danang and Hue-Phu Bai. He served with the First Air Cavalry Division while in Viet Nam. After Vietnam he spent a number of months at Fort Riley, Kansas before being transferred to Europe. He spent a short time in Germany before being permanently assigned to NATO headquarters in Mons, Belgium. While stationed in Belgium he met and married his first wife, Christine Whitmarsh. Jim was discharged from the army in March of 1970 at Fort Hamilton, New York and returned with his new wife to Eastern New Mexico University (ENMU). Jim and Christine had 2 children, James Richard and Poppy Elizabeth. While Jim was a student at the Eastern New Mexico University he worked in the Facilities Management Department as grounds supervisor and later worked in the Mechanical Department. Jim graduated from ENMU with a Bachelor of Science degree in 1974 and was employed as the Horticulturist for a Hydroponic greenhouse vegetable growing operation in Tucumcari, New Mexico and Fabens, Texas. Jim's next job in 1978 was as Horticulturist for a wholesale flower production greenhouse in Tome, New Mexico. In 1981 Jim was employed by New Mexico Institute of Mining and Technology (NMT) a small science and engineering university in Socorro, New Mexico as Associate Director of Facilities Management and was promoted to Director in 1982 and held the position for 25 years. Jim was also an adjunct faculty member for Eastern New Mexico University teaching Turf Grass Management. He also taught Horticulture for the community college at NMT. Jim's wife Marie Garcia Shaffner was a teacher, Principal, Director of Instruction and Superintendent of Schools in Belen New Mexico. She retired in 2001 after 28 years of service to the Belen School District. Marie and Jim currently live near the Tome' Land Grant in Tome' New Mexico. The grant was a 400,000 acre tract of land given to 26 residents of Tome', New Mexico by the king of Spain in 1739. Marie is a descendent of one of these families. The provisions of the 1848 Treaty of Guadalupe Hidalgo gave title to 26 signatories. One of the these was Francisco Sanchez who was the grandson of Juana Lopez de Aragon and the fifth great grand parent of Marie Garcia Shaffner. The Sanchez branch of her family is documented to have been in New Mexico in 1600, near the time of the arrival of the Juan de Onate Expedition in 1598. Madalena Sanchez de lnigo, eighth great-grandmother of Marie Garcia Shaffner was married September 6, 1609 in Puebla de los Angeles, New Spain and was the mother of Fray Francisco Munoz, father of the Juana Lopez de Aragon children. This family is considered to be one of the twelve founding families of Albuquerque. Shaffners, on Safari in East Africa. The safari began in Nairobi Kenya and included two game sanctuaries within Kenya. Many pictures were taken of birds, animals as well as photos of members of our group and people of Kenya . Video Clip of the trip. Shaffners in Antelope Canyon, Page, Arizona. Antelope Canyon is just outside Page, Arizona and is truly a mystical place with colors that change every few minutes and sounds that echo off it's walls in various volumes. It is a photographers dream. Shaffners in Arches National Park, Utah. Arches National Park preserves over 2,000 natural sandstone arches, like the world-famous Delicate Arch, as well as many other unusual rock formations. In some areas, the forces of nature have exposed millions of years of geologic history. The extraordinary features of the park create a landscape of contrasting colors, landforms and textures that is unlike any other in the world. Near Siem Reap, Cambodia are the temples of Angkor Wat and the minor temple of Ta Prohm built in about the 12th or 13th centuries. The temple of Ta Prohm is eerily covered with the roots of the Banyon tree. Every roof, hallway, and the various entrances have Banyon roots attached to carved stone blocks. It has been preserved as it was found with the jungle taking over. Angkor Wat has been completely restored removing the jungle exposing a magnificent temple. 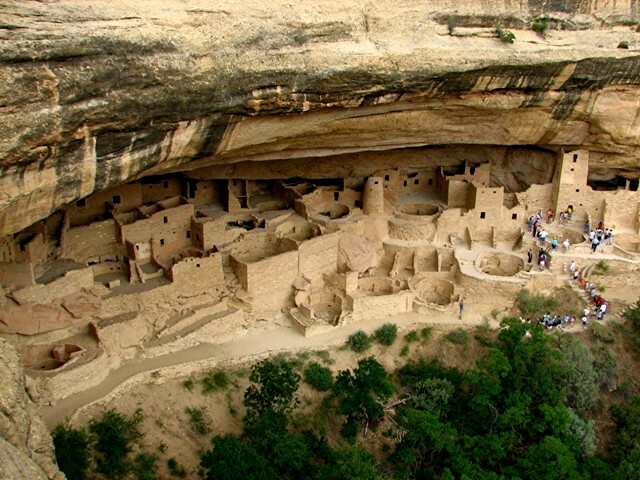 Shaffners in Colorado: This state has some of the best preserved Ancestral Puebloan ruins in the United States. One of these ruins was discovered by Richard Wetherill , his brother-in-law Charles Mason and Acowitz, a Ute tribe member. Richard started his lifelong works when he stumbled upon this ancient stone city while searching for cattle near Mancos, Colorado on December18, 1888. They saw across a canyon what Richard later called "Cliff Palace". Richard and Charles stopped looking for stray cattle, crossed the canyon and lowered themselves into the ruins of the city and explored for several hours. They agreed to separate and look for more ruins and agreed to meet back at the place they had first seen Cliff Palace. Richard returned that evening and reported he had found another ruin he called Spruce Tree House. For Richard, this was a turning point in his life. He began exploration activities in Utah, Colorado, Arizona and New Mexico. Shaffners in Playas, New Mexico-Terror Town. When New Mexico Tech, a state supported university purchased the town of Playas, New Mexico, Jim was Director of Facilities at the university. Jim and his team were selected to examine the facilities and set up the management for the small town of 259 homes which included a medical facility, bank, parks, churches and other infrastructure typically found in a small town. The team included most of the management from the university facilities department.